The black and white portrait above is of my assistant John (UNEDITED) on a 25 degree day (1/5/16) in downtown Raleigh NC. John was actually holding the Profoto B2 light setup pictured on the left above with a 24 inch Profoto octabox attached to it. I had the idea of John letting the monopod rest on the floor pointing slightly up at his face creating the shot that you see above. It was shot with a Canon 5D Mark III and a 70-200mm Canon lens set at f/2.8. This is an example of a behind the scenes shot that's not the usual style of seeing gear or the photographer in action. John and I were staying warm in the lobby of a building in downtown Raleigh waiting for our subjects to come down to be photographed outside on a 25 degree morning. 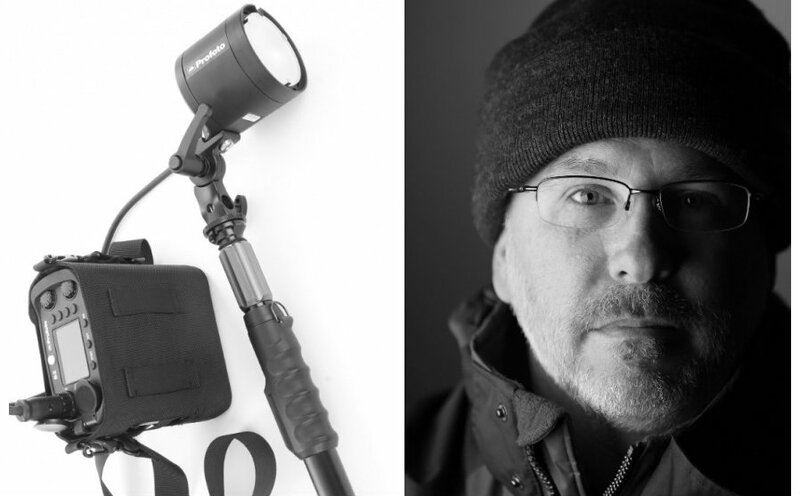 John was holding the Profoto B2 setup, so that he could act as my human light stand which definitely saves time. It's a dramatic portrait with the lighting style use, John's expression and being in black & white. It was simply me killing some time waiting on our subjects for the actual photo-shoot that we showed up for which goes to show that you should always be ready with your camera to grab a shot that you may have not originally planned on. Being a professional photographer is very rewarding, but getting shots like this that were not part of the plan is even more rewarding. Happy Shooting!